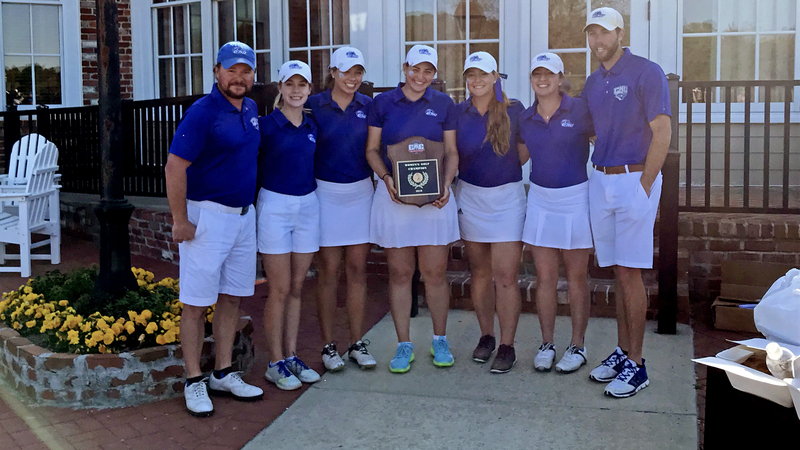 In the first ever Capital Athletic Conference Women’s Golf Championship, the Christopher Newport Captains overwhelmed the competition, placing all five starters in the top six on the leaderboard to capture the first conference title ever awarded in women’s golf. Rookie Erica Whitehouse (+4) ran away with the individual medalist honors to lead the way for CNU, who captured the team title by 141 strokes over second-place York (Pa.). The league championship featured three first-year programs competing for the conference title on the Palmer Course at the Bay Creek Resort in Cape Charles, Va. A 54-hole event, the Captains fired a three-day 993 (326-345-322), good for 129-over Par. York finished in 1134 strokes (381-377-376) at +270 and Southern Virginia University finished in 1311 (440-431-440) for a +447 score. The Captains historic win came courtesy of the program’s lowest single round of the year, scoring a 34-over 322, one stroke better than the previous mark set at the Jekyll Island Women’s Collegiate. In addition to the team’s record-breaking performance, Whitehouse also put together the finest individual performance in the young history of the program. With back-to-back 73’s in the first two rounds, the freshman set a new CNU scoring record, while adding a 74 on the final day, good for the third best score of the year. Whitehouse (+4) won the individual championship with a 220 (73-73-74) in a dominating performance. The Mechanicsville, Va. native led the event in Par 3, Par 4, and Par 5 scoring, while also leading the 14-player field in pars and birdies. On the long holes, Whitehouse was two-under with an average score of 4.83, six strokes better than the next player on the chart. In Saturday’s final round, Whitehouse made the turn at Even par with one double-bogey paired with back-to-back birdies on five and six. On the back nine, she had four bogeys, two more birdies, and three pars. Over the three-day tournament, she had just one double bogey per round with 12 total birdies and 29 pars. CNU was nearly perfect as a team, placing all five starters in the top six finishers. Behind Whitehouse was runner-up Cameron Cook (+30), third-place Katie Thome (+35), fifth place Abbey Forde (+63), and sixth-place finisher Harper Lurie (+65). Cameron Cook scored a career-low 77 in the final round and was particularly impressive on the front nine Saturday morning. She finished the first nine holes in just 34 strokes, carrying a two-under score into the turn. She birdied three holes and bogeyed just one with five pars on the front nine. Cook finished the 54-hole event in 246 strokes (82-87-77). Katie Thome wrapped up a consistent appearance at the CAC Championship with a 251 (84-84-83). Abbey Forde scored on the final day with a 16-over 88, also establishing a new personal scoring low. Forde finished in 5th place with a 279 (89-102-88). Finally, Harper Lurie closed out a sixth-place finish with a 281 (87-101-93). Christopher Newport now has two wins and two runner-up finishes in the first year of the program. Heading into the postseason tournament, the Captains were ranked 50th in the GolfStat Relative Rankings, while Whitehouse was ranked in the top 50 individually with a 78.50 stroke average. After this weekend’s tournament, Whitehouse improved her season stroke average to 77.8, which would rank her in the top 30 nationally based on the most recent statistical update.